I've been going through a period of clarifying and really drilling down to what it is I really want my life to look like and what I most want to share. I've been using a process of asking myself many questions, but differently than I have before. I learned about "Question Mandalas" on Heather Plett's site. She explains that you can begin with an image that represents your questions in the center (like a butterfly for transformation) and then spiral out questions from there, adding the patterns of the mandala. I just began with a main question in the center and branched out with more questions. 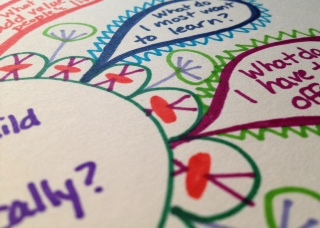 I put the questions down in my mandala but did not attempt to immediately answer them. I let them rest on the paper but I've visited them over the past week. I mulled them over as I drove in my car, as I waited in line at the store, before I fell asleep at night. Then yesterday, the answers started to flow in this little Q & A with myself. As I asked the questions, the answers emerged. Q) Do I want to teach kids? Q) What do I have of value to offer others? A) It turns out, you've been building up to this your whole life. You already have exactly what you need. You know enough (despite those gripping moments of fear.) You already have the tools to build a business, now just refine it. It's powerful stuff that can propel people to succeed and it's really exciting. Get your thoughts organized and test them out. On yourself. On your friends. On anyone who will listen. Q) What do I most want to learn? A) To know yourself as you truly are. To follow what most excites you. To share in a way that uses and builds your strengths and inspires you to grow and expand creatively and exponentially. And beyond that, you want to learn about everything you possibly can that interests you and fuels you. Q) What do I get most excited about sharing? A) Painting and teaching others (specifically new or beginner artists and kids) the joy that can be found in expressing yourself creatively. Learning to trust your own intuitive wisdom, without judgement. The juicy part of painting and creating is what is reflected back to you when you take the time to process your experience and listen to what it's showing you. You love to watch kid's eyes light up when they learn something fun and new. You love collaborative brainstorming with other artists and helping them to move forward in their own businesses too. Q) How much time can I devote to this? A) As much as it takes. This work feels like play and is a natural unfolding of what you've really been working up to all of these years. Re-order and prioritize to give it the time it needs to grow. We all have unresolved questions that can keep us stuck. They keep rattling around and around and make us anxious and unsure. Why not invite them in? Spend some time with them in a new and visual way. Dress them up with ink and frills. See what they have to teach you. You might ask these questions again next week and get different answers, but that's a sign you are growing, evolving and changing.